An introduction to new monasticism could easily depict it as little more than a radical expression of Christian community best understood through a catalog of its common practices. 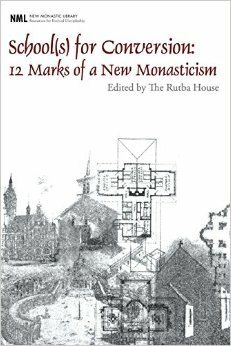 School(s) for Conversion: 12 Marks of a New Monasticism, which was the product of a 2004 gathering of new monastic practioners, provides an excellent introduction to these characteristics, but its more central and easily overlooked contribution is the identification of its teleological nature. These eschatological underpinnings are the basis for the deservedly disproportionate impact the New Monasticism (NM) is making in contemporary ecclesiological reflection and discourse. This essay will highlight the eschatological directionality of the twelve marks in School(s) for Conversion and engage critically with the implications Jonathan Wilson-Hartgrove suggests for the broader Christian community in New Monasticism: What it Has to Say to Today’s Church. Jonathan R. Wilson—not to be confused with his son-in-law, Jonathan Wilson-Hartgrove—coined the contemporary usage of the term “new monasticism” in his 1997 book, Living Faithfully in a Fragmented World: Lessons from MacIntyre’s ‘After Virtue’. In it, Wilson recounts MacIntyre’s sweeping assessment of the moral condition of our “new dark ages” and highlights MacIntyre’s call for “construction of local forms of community within which civility and the intellectual and moral life can be sustained” noting that what the world needs now is “another—doubtless very different—St. Benedict”. In contrast to the pragmatic approaches to Christian community evinced in most churches, either toward self-preservation or world-impact, the NM, inasmuch as it is faithful to the way of Jesus, is “living by that which is seen by the eyes of faith and sustained by the presence of hope; living eschatologically is making present that which is yet to come.” It must devote its life to the “eschaton revealed, established and consummated by Jesus Christ.” This eschatologically grounded vision for a new community is apparent in varying degrees in each of the twelve marks, and it is to these that we now turn our attention. Sister Margaret McKenna, writing on the first mark, relocation to abandoned places of Empire, views relocation as a liturgical renouncement of the “dirty, rotten system” of Empire because it moves to places that are regarded as attraction-less and therefore are “left alone by the political, economic, and social powers that be.” Relocation is an act of resistance to “imperial pressures and pleasures and rewards conformity to the way of all empires: pride, power, and reduction of all values to the “bottom line.”” Israel’s forty years in the desert, according to Jonathan Wilson-Hartgrove can be seen through this lens as a way of getting “Egypt out of their system.” Purged of the deceptive ethos and non-telos of Empire, God’s people are opened to the possibility of fresh eschatological vision. As a fourth mark, the NM laments the racial divisions within the Church and our communities combined with the active pursuit of a just reconciliation. As Chris Rice notes, the presence of such divisions is a constant reminder that the Reign of God is “not yet”—that “true reconciliation is only in the eschaton”. And yet, this “lament is not only a cry of grief…but a declaration of hope”. Humble submission to Christ’s Body, the Church indicates the NM’s desire to not only learn from Christian history, but for each community to unite itself in accountable relationships with established Christian denominations. This ecumenism has its roots in not only practical considerations, though these loom large, but also in the eschatological vision of a united Bride of Christ. Jesus’ main concern [was] to help the disciples “see” the Kingdom of God as a present and in-breaking reality, and seeing it, to locate their lives in an adventure of living together, now, this future that God intends for the whole world. Living together this future is something the NM pursues through intentional formation in the way of Christ and the rule of the community along the lines of the old novitiate. Mark seven is nurturing common life among members of intentional community and has as its aim the hope that “neo-monastic communities may provide a space where Christians can taste the eschatological hope of salvation”. Jana Bennett assert that the eighth mark—support for celibate singles alongside monogamous married couples and their children—“is eschatological, which means that marriage and celibacy are always supposed to make us aware of who we are, whose we are, and where we are going as God’s people.” This relativization of states of life testifies to the eschatological priority of the Christian community as primary family. Thus the NM takes to heart Jesus teaching “whoever does God’s will is by brother and sister and mother” and attempts to live according to this vision. Mark nine is geographical proximity to community members who share a common rule of life. Jon Stock sees proximity as practical necessity for the formation of a space with “an atmosphere that tastes and smells like the Kingdom of God,” without which gospel proclamation rings shallow. The tenth mark of the NM is care for the plot of God’s earth given to us along with support of our local economies. The commitment to creation-care underlying both of these activities looks ahead to the eschatological renewal of our now-groaning planet. Peacemaking in the midst of violence and conflict resolution along the lines of Matthew 18 is the eleventh mark, and rests upon the conviction which John H. Yoder is invoked to express: “Nonviolence is right, in the deepest sense, not because it works, but because it anticipates the triumph of the Lamb that was slain.” As communities handle internal conflict directly and graciously, and confront violence, their very lives become a sign of eschatological hope. The final mark of the NM is a commitment to a disciplined contemplative life. Jonathan Wilson-Hartgrove speaks of contemplation as “the way Christ has opened for us to receive his mind” and as our active opening to God’s work of perfecting us. Of course, this perfection and Christ-mindedness is another dimension of the eschatological future which Christians agree, in varying degrees, is breaking into the present. The poignancy of the NM for contemporary ecclesiological reflection stems from its eschatological orientation. In a time when it seems church leaders are desperate for new ways to “do church,” ala missional and emerging church conversations which take as their starting points either the past (missional) or the present (emerging), Jonathan Wilson-Hartgrove offers the mainstream Christian church several practical proposals based on the NM’s experimentation and experiences of the in-breaking future. After briefly reviewing these recommendations, I will offer some critical comments in conclusion. According to Wilson-Hartgrove, the NM, because of the nature of its intentional communities, has learned to read the Bible primarily as a “manual for how to live together as God’s people.” Approaching the Bible as a resource for the formation of a peculiar people, through whom God intends to save the world, leads Wilson-Hartgrove to offer three implications for the wider Christian church. Wilson-Hartgrove’s recommendations for traditional churches, while fine advice, are surprisingly unradical. He overcomes idealism by acknowledging that living in a new monastic community is not God’s intention for every Christian, but goes too deep into a realism based on the limited imaginations of the mainstream and as a result the changes he proposes are disappointingly pedestrian. As a result, his prescriptions may merely reinforce the status quo in most churches since the tone suggests that radical change is not necessary. Whereas the NM seeks to model itself after the eschatological new humanity, Wilson Hartgrove’s recommendations seem limited by the pragmatism of “what pastors might actually be willing to do”. The NM, as a public resistance to Empire, is a prophetic demonstration of the in-breaking future Reign of God. Rooted in the eschatological realities of a new reconciled humanity and an economy of abundance, its very presence challenges the traditional church’s earth-bound pragmatism and promises to stimulate bold reassessment of the proper shape(s) of Christian community today. Unfortunately, Wilson-Hartgrove acquiesces to the mainstream church’s pragmatism by offering pedestrian recommendations that blunt the sharp edge of the NM’s prophetic testimony. St. Benedict's Rule for Today? House, Rubta. Ed. (2005). School(s) for Conversion: 12 Marks of a New Monasticism. Wipf & Stock Publishers. Wilson-Hartgrove, Jonathan. (2008). New Monasticism: What It Has to Say to Today’s Church. Brazos Press. Wilson, Jonathan R. (1998). Living Faithfully in a Fragmented World: Lessons for the Church from MacIntyre’s After Virtue. Trinity Press International. Though Wilson coined the contemporary usage, Bonhoffer used the phrase in a 1935 letter to his brother: “The restoration of the church will surely come from a sort of new monasticism which has in common with the old only the uncompromising attitude of a life lived according to the Sermon on the Mount in the following of Christ.” Dietrich Bonhoeffer, Testament to Freedom (San Francisco: HarperSanFrancisco, 1997), 424. Rubta House, 15. “Dirty, rotten system” is a phrase Dorothy Day used often. In defense of my characterization of the starting points of the missional and emerging conversations, I suggest that missional dialog often launches from a review of the called and sent nature of Abraham, Israel, Jesus and the disciples where as the emerging church conversation generally launches from an assessment of our contemporary postmodern context.